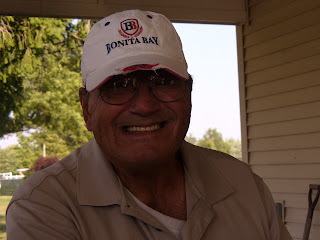 Lil' Blog and More: Update on my grandpa..
Hey everyone. Here's an update on my grandpa.. So.. Not the best news. So, on my birthday, November 11th we go up to Tampa with the plan of getting a pre-op for my grandpas surgery to get the Hernia removed/pushed back in. we get up there and the doctors are taking X Rays. That's when the worst thing happened. They found something in his chest Xray. So they told grandpa they couldn't do the surgery and he'd have to come home to Bonita to see his other doctor. So the next day, Friday, we go to see his regular doctor. They ran some tests, but they still have no idea what it is (PLEASE don't let it be cancer again!!!!) But my grandpas regular doctor gave the other doctor permission to go ahead and do the surgery.. So in about 3 hours we leave for Tampa, again. Grandpa will officially be getting the Hernia taken care of, which is great, but now we still have his chest Xray to worry about.. I'm about to start working on a giveaway post for all of you, but I'm not sure if I'll have it up. Sorry for any disappointment. Please keep my grandpa in yours prayers. This is like a never ending battle, and it is just so nerve wrecking. I haven't been able to keep my eyes dry for more then 6 hours. My grandpa is the only father figure I've ever had and even though we've fought a lot in the past, I love him so much and I would do anything to see him get better. I'll keep you all updated with any news I get. Sorry for the lack of giveaway posts and such. I'm doing my best. He is in my prayers as are you & the rest of your family. Sometimes, when people get older they like to err on the side of caution knowing as you age you can't have 2 or 3 things taken care of at the same time like you could when you were young. I am glad to hear he is getting the hernia taken care of- it probably bugs him at times. Hoping the chest XRays come out clear & sending you hugs clear from Iowa. Take care & keep us up to date when you can. Your family comes first. Don't worry about some silly blog - it will be here when you return. You and your grandpa will be in my prayers. Waiting and not knowing what's going on is terrible. I agree with Tannawings...family comes first. Give your grandpa a hug and take care of yourself, too. I will pray for you all and I agree with the other posts. Don't worry about your readers, we will be here when you are able to get back to us. Focus on your family. You & your family are in my prayers. Family is definitely first! I am sure everyone understands that! Hugs to you sweetie! Amanda, you, your grandpa and the rest of the family are all in my thoughts and prayers. Please keep us updated and don't worry about the blog or your readers - we'll all be here when you get back. Sending you Texas-sized hugs! Your Grandpa, You and your family are in my prayers!!! Amanda, you poor girl. I am keeping your family in my prayers. Give your grandma a hug, and your grandpa too and stay strong. Sending you strength and hugs!! Aww, Amanda, please don't worry about silly giveaways. Your Grandpa should be your #1 and only priority right now. My Dad was my son's only father figure too. And unfortunately we lost him, so PLEASE spend as much time as you possibly can with him for as long as you can because you never know what may happen. Silly giveaways can wait!